And then, to top it all off this week, Koko the gorilla had to go and die. Koko famously could use a form of American Sign Language to communicate with humans. Over the years, through her chats with her human handler, Penny Patterson, she seemingly displayed a depth of emotion that, if not quite rivaling our own, at least approached it. Just how much Koko really knew or felt is up for debate -- there are definitely skeptics, and there is little published research. But that doesn't mean she wasn't one amazing ape. Take a look below at these Best of Koko videos, and then at the bottom of the list at an NPR piece on whether "talking apes" can really talk. 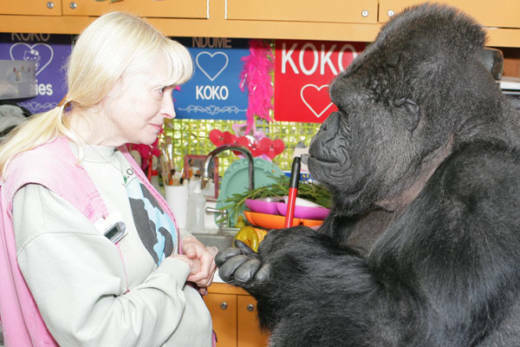 Koko is the only primate in the world to upstage Robin Williams. Watch as she demands tickles from him. 2. One of Koko's kittens was called AllBall, but AllBall died, sending Koko into a depression. 3. Koko plays with a yellow balloon, and it's a lot more interesting than it sounds. 4. Koko can't bear to watch the goodbye scene in the movie "Tea With Mussolini." 5. Koko, like everyone else, loves Mr. Rogers. 6. Shatner. Koko. Need we say more? "I found myself saying, 'I love you, Koko, I love you.' "
7. Koko wants a baby. 8. Koko's pal Michael could also communicate with humans. Here he tells a harrowing story from his past. 9. NPR's Skunk Bear video looks into the question of whether apes can really talk to humans.